Flex Shot Reviews - Is it a Scam or Legit? Flex Shot brags that it’s the easiest way to caulk, bond, and seal virtually anything. They claim their caulk-in-a-can is ideal for hundreds of household projects, including fixing leaks and filling huge cracks and holes. Flex Shot says it is brought to you by Phil Swift, the maker of Flex Seal, a popular spray-on rubber sealant. Flex Seal/Shot appears to be based out of Van Nuys, CA but the business is neither rated nor accredited by the BBB. Flex Shot seems to be a pressurized dispenser of a caulk-like substance. They tout it’s the neat and clean way for anyone to easily make repairs and that it’s made in the USA. They claim unlike regular caulk, it doesn’t dry out, shrink, or crack, lasts up to 30 years, and there is no waste. They tell you to throw away your old caulk-and-gun and that you can use your can of Flex Shot again and again. They indicate you can use Flex Shot on almost any surface, in kitchens, bathrooms, for crafts, plumbing or structural leaks, and both indoors and outdoors, as long as it’s a well-ventilated area. Simply point at a 45 degree angle, press against the spray tube, and run along the seam you are trying to seal. Flex Shot also includes an extension tube they say you can cut to adjust the thickness of the bead as well as accessing hard-to-reach areas with pinpoint accuracy. When done, they say to release the tube and wipe excess with finger or dry paper towel. They claim you will have a perfect beaded seal that is completely waterproof every time with no running, dripping, or mess. While they say it’s better on a dry surface, they say you can use Flex Shot on one that’s wet, but not in standing water. They declare that using Flex Seal will help prevent mold and mildew. They assert it will adhere to almost any surface that’s free of grease or oil, including porcelain, tile, metal, glass, fiberglass, wood, granite, stone, marble, fabric, upholstery, and paper. They claim you can use it to fix broken ceramics. When Flex Shot is dry, they claim it turns into strong rubber that both expands and contracts. They tout some of its uses include on sinks, showers, tubs, tiles, windows, skylights, roofs, gutters, autos, boats, RV’s, campers, PVC, ducts, decorative items, and more. They exclaim it will not fade, dry, crack, yellow, or deteriorate from contact with household cleaners. They add it can withstand temperatures from -76°F to 350°F. They caution that Flex Shot is not recommended for use to fix tires or under extreme pressure; that it has not been tested on portable drinking water systems; and that you should not paint over the seal. They claim one can of Flex Shot is good for 50-100 linear feet, depending on the thickness of the bead. Flex Seal is sold as “buy one get one free” on their website for $19.99 plus $9.95 S & H for a total of $29.94 for 2 cans/extension tubes. You can add a “free” can of Flex Seal for an additional $9.99 S & H for a total of $39.93. (You can also add shipping insurance in case of loss, damage, or theft for $1.99.) They ask that you please allow 2-6 weeks for shipment. When you receive your order, they claim you have a 100% satisfaction guarantee, but the fine print reveals you may only return UNUSED cans for a refund, minus S & H and what it costs to return. Bottom Line: Is Flex Shot a Scam? Caulking guns can be drippy and messy, so we love the convenience and ease-of-use of Flex Shot. We’re not so crazy about its return policy or the expensive shipping fees. Some have also pointed out that Flex Seal appears to rubberized undercoating, which can be bought at any automotive store. We suggest if you do buy this product, don’t add the Flex Seal. My cartop carrier had a crack in it. So I figured I'd go and get a tube of silicone. Then I remembered seeing the Flex products on TV. I thought it a little pricey, but I thought I'd give Flex the benefit of the doubt. So, I bought a can of Flex Shot. SAVE YOUR MONEY! All it is is silicone, as soon as I cut the tip open I knew I'd been had. I dealt with silicone many times in my lifetime, so I know what I'm talking about. Same distinct smell as silicone. Same consistency, same texture. ALL IT IS, IS SILICONE! $13 to be had, when you can get a squeezable tube of silicone for around $3.50 or $4.00. If you got a caulk gun get the cartridge. You get more and pay less. FLEX SHOT IS A TOTAL RIPOFF! If I could give this review zero stars I would. I have two cans of Flex Shot Clear that I have to throw away. Neither has been used, but evidently, when you buy it, you better use it right away. Its seems they lose their ability to come out when you push on the nozzle. All the air is gone from the cans. Bummer, there goes $40. The product claims to be a rubberized sealant. I bought two cans for a job that I thought needed something more reliable than silicone. I was very disappointed when I started applying the caulking, only to find out it was just silicone. Don't waste your money. Just pay $5 for a full-size tube of silicone and save money. I tried to use Flex Shot on a water tank on a refrigerator. I put the Flex Shot on it, let it sit awhile, tried the water, and sure enough, water came shooting out. So I would say this product does not do what it says. I will never buy it again. I'm not sure if Flex Steel is related to this product, but I put Flex Steel on the water tank, and it did not work either. Water squirted out the sides where there was no tape. Both of these products are not any good if you ask me. I will never buy either one again. I did not want to give any stars, but I had to in order to upload my review. I used Flex Shot for my tub (linoleum meeting tub), removed all old caulk (12 years old) and finalized with IPA. I then taped off with blue masking tape and applied flex shot. Best Caulk job I have ever attempted as the old fashion caulk gun has never done me right. I then used Flex Shot around my kitchen sink. Worked great. Wear disposable gloves for all work as you can use your finger to smooth. I then used flex shot to repair a few cracks around my gas fireplace molding which after 12 years had cracked, I will let dry and cover with matching paint. Thank you. It worked as described on TV. Used to seal my kitchen sink. It applied great. After use, the tube would not stop oozing material. I could not stop it and it used up the tube. I'm very disappointed. I use the Flex Shot in my upstairs bathroom to caulk around my tub and shower. Being a two story home we have a little shifting from time to time which causes the other caulks to pull away from the wall leaving gaps which let the water seep down through. I would have to re-caulk several times a year. The Flex Shot is flexible enough to move and keeps its seal. I also use it around my baseboards where little gaps can form. At those times during the year when ants find their way in I use the Flex Shot to seal those gaps and it stops my ant problem. I also use it to seal the bottom of my bathroom mirror where it meets the counter top. It keeps the water from seeping through and causing those gray areas at the bottom of the mirror. The only problem I have with the Flex Shot is that I can't find it in stores anymore. The stores carry the Flex Liquid and the Flex Seal but not the Flex Shot. 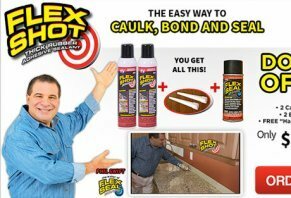 As I wrote about Flex Seal (see my previous review), Flex Shot's quality is yet to be seen as most caulk is OK for awhile, the quality will tell with time. BUT please understand this, ANY caulk you use or apply around anything must be tooled. Yes tooled, which means your finger, or a special tool to press it into place because when it dries it shrinks. What they show on TV is so wrong. Caulk will shrink when dried & mostly no seal will be made. You must tool the caulk, cut the corner off a square piece of hard but flexible plastic & run along the caulk to tool it in place, clean the plastic as needed. This is a must on any caulk or you're wasting your time, money & caulk. I have 25 years of experience. I used rubberized (elastomeric coating) coatings all my life in my business as a roofing contractor. I rolled or sprayed it over polyurethane Foam Coating as a UV protectant, and a GOOD rubberized coating depends on the amount of solids content which is titanium dioxide. One cannot put enough of the solids in a spray to do this. Flex Seal, which I've tried, is one of the biggest rip offs of the century because when it dries, about 1/2 is gone with the wind in evaporation. One application requires five or more to completely seal anything temporary. Lowes has Rust-toleum Leak Seal and another spray that's much better and cheaper than this junk. Please don't waste your money. The truck underwater is a lie, no Flex Seal is ever going do that. These people play off the ignorance of the public or the uninformed consumers. Beware! Call order, they try to force you to order more than you want. Website, first of all, it doesn't say buy one get one free, it says buy 2 cans for $19.99 + $9.95 s/h + $9.99 for processing. Second, tried to order two cans online, then AFTER I put in my credit card info, mysteriously there was two more cans on my order they tried to charge me for, NOT FREE, which totaled my bill to just over $80.00. Quite a bit for an order that was supposed to be $39.93 all together. A family member ordered cans of this stuff, and after three days, it shrank and peeled at the edges. Just got two words for you - DON'T BUY, BIG SCAM. I went to their site to see how much it would cost with 19.99 and shipping. The total price was 39.93, which is almost double the advertised item. I did not push the order button, I took my name and information out of site and got off the web. Next day I am being charged for the item. I called and they would not refund my money. They said they would not charge freight. I do not want the product due to their way of doing business. They said I could send it back at my own expense. I would never recommend them to anybody and I will tell people of their business tactics. Lesson learned! For future reference, anytime you order online and they overcharge you, refuse to refund your money. If any way possible get the tracking info track the package is there when it's expected to arrive! Then do not accept the package! Tell USPS, UPS, FEDEX, whoever that you do not want it you refuse the package. They have no choice but to return it to sender! Been there, done that! Takes time, but you call them, email them etc, say I refused your package now return my money. They have no choice but to return your money. I ordered the Instabulb plug only ordered one they charged me for 12 at 10 bucks a piece! I was livid not happening. They pulled that crap. I live in a mobile park, mail is delivered to a box, I called the office manager and told her do not accept the package. I got all my money back. Write a Review for Flex Shot!